Looking to turn up the heat on a easy Saturday morning brunch party? This Italian Breakfast Bake is a perfect make a head item that you can throw in the oven at the last minute. 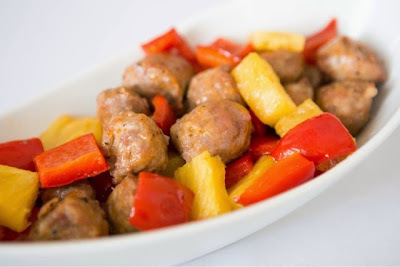 Cut Italian link sausage in to one inch pieces and throw into baking dish. Cut bell pepper and pineapple into similar sized pieces. Coat with olive to prevent sticking and season with salt. Place in 450 degree oven for 25-30 minutes or until roasted and bell peppers are brown around the edges. Enjoy with warm crusty bread, biscuits or just how it is! Photos are curtesy of Faison Anne Photograhy.